The Indian Premier League also known as the IPL.it was started by the Indian Cricket Board by the BCCI in 2007. Which is a 20-20 cricket competition.IPL is a very big league played in India which is also quite popular in world, not only in the entire india.The world's mostexpensive Indian Premier League is the number of cricket leagues played in the world.Among them, most of the money is levied on the players. IPL is played every year.Which starts in March or April.The first season of IPL T20 cricket was played in 2008. So far 10 seasons have been played.Whose last edition was the 2017 Mumbai Indians winner With this, the name of the MumbaiIndians is the record of the highest number of ipl titles. 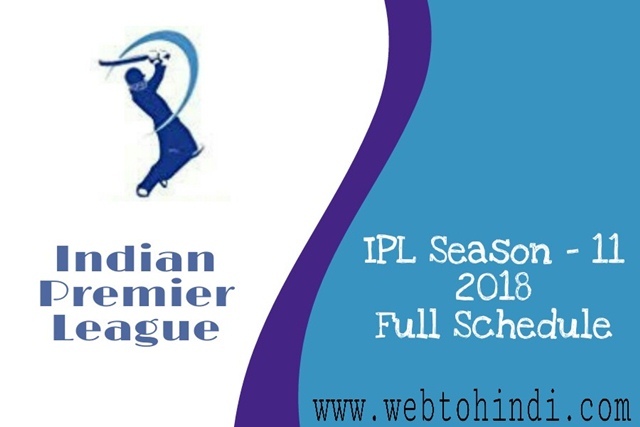 The Vivo ipl 2018 season 11 May 8 teams will participate.In which total 60 matches will be played The first match will start on 7April and the final final match will end on 27th May. So today we are going to tell you the match of the Indian Premier League's season-11 match and will be played.And at what time it will start.